Cora Tilt & Slide doors offer a highly versatile means of ventilation with an entry/exit facility. These doors offer an advantage of a sliding door along with the ability to have ventilation without having to slide the whole door. 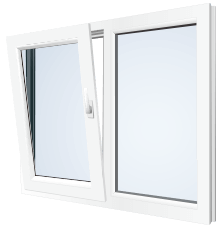 With just a simple turn of a handle, the door sash can be tilted providing secure ventilation. With another turn, the sash slides open parallel to the fixed unit, not into the room, for space-saving functionality.